Masterplan started out as a project by former Helloween members, guitarist Roland Grapow and drummer Uli Kusch and Norwegian big voice Jorn Lande. The guys released two very good albums, their self titled debut in 2003 and Aeronautics (2005), that contained the cool contrast of Grapow / Kusch’s Power Metal roots and Lande’s Dio and Coverdale influenced voice. 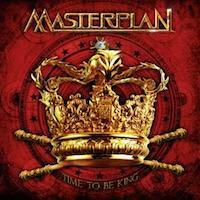 Never a power metal fan, it took me a while to give Masterplan a break. I always did dig Helloween, but the fact that when Grapow joined that band was when they started to slip which made me uninterested in giving the band a go. But when I did, I had to surrender because those first albums were great. By the third album, both Lande and Kusch were gone, replaced by drummer Mike Terranna and vocalist Mike DiMeo, formerly of Riot. With Kusch as the main songwriter, the album failed both sales wise and with the critics. DiMeo didn’t last long and after going back and forth Lande found it best to return to the project, much to the joy of Masterplan fans. I must stress, though, that the Lande-less album MK III (2010) wasn’t all that bad. Kusch, however, chose not to return and even though this new CD is better than its predecessor, it shows that one of the main song writers aren’t present. Because me, just like many more Masterplan fans, had great expectations on this album. Even though this is a pretty good album, I had hoped it would be lots better. ”Far From The End Of The World” would do as a great single with its Rainbow meets Power Metal catchiness and ”Lonely Winds Of War” is a really heavy piece. Great song! As a new start, this album works even though it isn’t up to match with the two first albums, but why a killer song like the heavily Queen influenced ”Kisses From You” is only on here as a bonus track is beyond me. One of the best songs off the album. And there lies the dilemma. Every time I listen to this album, I really like it, but as soon as it’s off my player, I don’t remember a song and I never think to myself that I really want to hear it again. The songs are too forgettable and there way too many fillers on it. Can’t complain about the production either – it has a big sound, very distinct and the performances by the band members are faultless, but something is missing. A good come back, indeed, but I have a feeling that these guys have more in them than they show here. Let’s just hope that they can keep this line up – or even better, get Kusch back – for some more albums and maybe they can work their way back to the brilliance of their first two records. But I guess this one will do for starters.